Moving a conversation around to spiritual things can be the most difficult part of witnessing. We can talk freely with our friends about many subjects, but are at a loss when we want to bridge the gap between everyday life and the Lord. What does driving to work every morning or playing golf or washing the dishes or changing the baby have to do with our spiritual lives? The tension here is between manipulating a conversation vs raising curiosity for authentic spiritual discussion. If evangelism is your ulterior motive for having this conversation, then your conversation will be manipulative because you are wanting to control it to get to your point. The following suggestions are adapted from Evangelism for the Fainthearted by Floyd Schneider, copyright (c) 2000. Ask the Lord to guide your thoughts and comments as you approach a person. Ask Him to work in your friend. It is God who does the work. You just have to begin the process. Talk about the weather, the slow service in the shop, the Little League game, sports, etc. Mention something that opens your life up just a little. Then, casually ask the acquaintance about that same area of his or her life. Example: Have you lived here long? Be sure that you really listen to what the person has to say. You will never run out of things to talk about: ask questions about the person’s birthplace, hometown family, education, work, vacations, retirement, interests, and hobbies. Once a subject has been mentioned, ask a question about it. Attempt to establish some common interests with the person. Be a good listener and use their name in the conversation. Check their body language to see if the person is comfortable with the direction of the conversation. The first levels of conversation are pre-evangelism. They build rapport. Don’t assume that a stranger or acquaintance doesn’t want to talk about religious things. Even atheists like talking about their views of God and most people appreciate having someone ask them about themselves and listening to their ideas or their problems in life. Talk about religion, churches, or church activities. A listening ear may be the very thing that causes a person to seek God. If the friend is not interested at this time, retreat to step three. Don’t push the gospel on anyone. Don’t feel guilty or become discouraged and quit witnessing altogether. Leave the results to God. Talk about what Christ has done for you. Keep your story simple or just share a few incidents. Ask the person two questions: If you were to die today, could you say for certain that you will go to heaven? Why should God let you into His heaven? Give a religious book that has a message of hope and get together in a few weeks to discuss it. 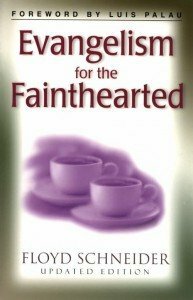 Order your copy of Evangelism for the Fainthearted by Floyd Schneider from Amazon (affiliate link).